It’s time for short eulogy to AVNR (strong buy). When I found what is the new Avanir drug is for Pseudobulbar Affect (PBA) I was slightly shocked. Wow, the combination of cough (cough suppressant) drug and antiarrhythmic drug (30 mg of each drug) can be effective in reducing the severity of PBA? The pathophysiology of PBA is currently unknown, although the disorder is thought to occur exclusively in the setting of neurological disease. The most influential theory on PBA posits that emotional outbursts are being generated in the brainstem autonomously due to loss of regulatory control by the frontal lobes. Although rarely life-threatening, PBA can have significant impact on patients’ quality of life and thus merits treatment. And the combination of cough suppressant and antiarrhythmic drugs helps to easy symptoms of this serious neurological disease and control emotional outbursts? So, proposed drug is effective. What about safety? Most active component of Zenvia is dextromethorphan (D). It is a component of the over-the-counter drug Mucinex DM (contains dextromethorphan Hbr 30 Mg). Zenvia taken twice daily will give 60 mg dose of D or 1/3 from smallest quinidine tablet. It’s practically nothing. So, it should be no problem with safety. So, why last time Avanir received an approvable letter from the U.S. Food and Drug Administration for Zenvia? The communication from the FDA indicates that AVANIR's application is approvable, subject to the FDA and AVANIR reaching agreement on what additional safety and efficacy data will be required. Honestly, I can't understand the part about safety. D is very safe (even for kids), Q most often side effect is diarrhea (24%). Sometimes FDA is very hypercritical. New data, including safety and tolerability data from the open-label extension as well as cardiac safety data from the double-blind phase of the Phase III confirmatory STAR trial evaluating the investigational drug Zenvia™ (dextromethorphan/quinidine) in the treatment of pseudobulbar affect (PBA) were presented in two posters at the American Academy of Neurology (AAN) Annual Meeting in Toronto, Canada. The new lower dose formulations of Zenvia have maintained statistically significant and clinically meaningful efficacy while providing an improved safety and tolerability profile relative to the original higher dose formulation. Conclusions: the probability of Zenvia rejection is very low. I don’t know about possible Zenvia price. Both components are not expensive: price of 100 tablets of 200 mg Quinidine Sulfate is $18 (http://www.prescriptiongiant.com/quinidine-sulfate-200mg-tablet-p-2988.html); price of 40 Mucinex DM tablets (Dextromethorphan Hbr 30 Mg In Each Tablet) is $11 (http://www.amazon.com/Mucinex-Expectorant-Suppressant-Extended-Release-Bi-Layer/dp/B000ALB4H2). It seems like that Zenvia should not be expensive drug. But PBA affects an estimated two million Americans with multiple sclerosis, Lou Gehrig's disease, stroke and other neurological diseases or trauma that can cause brain lesions. Currently no pharmacological agents specifically indicated for the treatment for PBA, antidepressants such as fluoxetine, citalopram, or amitriptyline have been prescribed with moderate efficacy. If approved, Zenvia will be prescribed to millions of PBA patients, may be for term of life. Low rick, very high reward. Disclosure: have AVNR in portfolio, will keep through PDUFA. One investor asked me what I’m thinking about “6 deaths in the trial arm compared to 1 death in the control arm”. And how FDA will handle this. It was really difficult question. However, these 6 deaths in treated groups in comparison with 1 death in the placebo group may scare any investor. In this latest interview they even clarified this: ” There were 7 deaths reported in the STAR trial, all among patients with underlying amyotrophic lateral sclerosis (ALS): 3 in the AVP-923 (30/10) group, 3 in the AVP-923 (20/10) group, and 1 in the placebo group. I think that it’s very important clarification because most people with ALS die from respiratory failure, usually within three to five years from the onset of symptoms. And there was no one death among MS patients in trial. Life expectancy of patients with MS is 5 to 10 years lower to that of the unaffected population. And no one death were ascribed to a cardiac cause (possible link to quinidine). ALS patients in placebo group were in slightly early stage of ALS (13.4 months) that in both treated groups (22.7 and 16.3). But these 3-9 months are enough big percent in average life expectancy of an ALS patient (2-5 years from time of diagnosis). So, I think that FDA will handle these 6 deaths appropriately. I will keep AVNR through PDUFA in spite of I’m understanding that FDA is crazy about safety now. May be now the risk of CRL for AVNR is higher (especially after HSP, ALXA, AMLN, ARNA and etcetera) i.e. AVNR has moderate risk, high reward. "Favus, in his notes, disputes Avanir's claims and contends that the Qt interval for "low dose" AVP-923 still runs afoul of FDA safety guidelines." "The AVNR 2009 10K disclosed that clinical cardiac safety studies with low-dose AVP-923 showed mean QTc prolongation above the FDA threshold of concern (5 ms mean increase)." But look at Table 6 from published paper about last AVNR phase III (STAR). 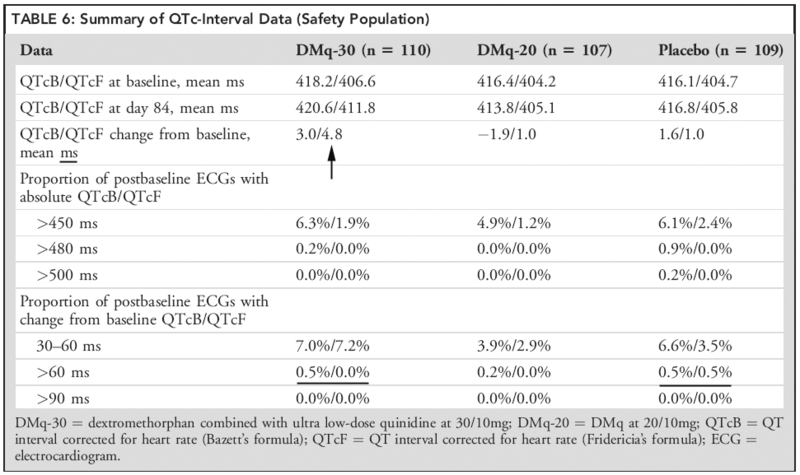 Biggest change of QT is 4.8 ms. At all time points assessed no DMq recipient had a QT-interval absolute value > 480 milliseconds or a change from baseline > 60 milliseconds. Do you see the prolongation of QTc above FDA threshold of concern (5 ms mean increase)? May be higher doses of Q did it but new formulation with ultra low Q has a good cardiac safety profile. I don't see any reason for FDA rejection. New formulation may be not so effective but it is safe.